By Peter C. Myers. Lawrence: University Press of Kansas, February 2008. ISBN 978-0700615728, $34.95. 272 pages. Peter C. Myers offers a timely exploration (particularly in light of the recent election of Barack Obama as the first African American President of the United States) into the ongoing conversation about race, politics, and natural rights liberalism. Myers revisits numerous perspectives from the Slavery era with a sharply insightful blend of objectivity and penetrating perception. The primary focus of Myers study is the slavery-era argument over racial equality and natural rights. Douglass was a staunch supporter of the belief in natural rights’ being embodied in natural law. Douglass “conceive[d] of the moral laws of nature as self-executing or naturally sanctioned[;] he held that in the nature of human affairs, justice and other virtues tend to be rewarded whereas injustice and other vices tend to be punished. . . .persistent virtue generally receives powerful reinforcement and persistent violations of the moral law generally prove self-defeating” (15). For Douglass, the Declaration of Independence’s doctrine that all men were created equal, was not just a politically based position, but was instead a universal Truth, a “moral prescription and sanctioned as moral law” (196). Myers’s book details the historical trajectory of natural law liberal philosophy in Douglass’s abolitionist discourse. Chapter one explores the nature of slavery and the questions of black humanity as considered by both slavery supporters and abolitionists. Myers revisits a number of slave-holders’ philosophical perspectives, which are effectively followed by Douglass’s counterarguments to those ideals. For example, a letter published in the North Star in 1850 by W.G. Kendall protested slave accounts of brutal treatment by their masters as “so highly colored, as not to be recognizable” and that slavery was a “great blessing to the black race” (33). Another similar argument was that abolitionists merely sought an unrealistic “utopia” that threatened to destroy the black race by urging them to leave the protective paternal umbrella of the slave-holders (34). A further position was that slavery was a “natural” condition in black evolution towards their eventual emancipation. Douglass passionately responded to such positions by pointing out that though there had been some humane acts towards slaves, those few acts are not representative of the “true nature of the regime” of slavery. As Myers explains, Douglass maintained that slave-holders as a class are not capable of establishing “paternal character” because as a “natural rule” they cannot exercise “irresponsible power benignly” (37). Chapter two begins with Dred Scott and the anti-slavery cause. For Douglass, his “invincible hopefulness” was at odds with his peers’ pessimism at the legal victory for slave-holder power. 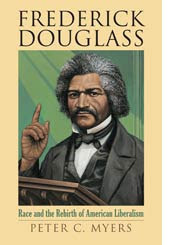 But Douglass truly believed that moral rightness will overcome slavery, that “Truth is mighty, and will prevail.” His adamantine conviction in the “laws of Nature and of Nature’s God”(49) gave fodder to his critics who charged that he “suffered from excessive idealism, closely linked to his excessive faith in the receptiveness of Americans to racial reform” (11). Chapters 3 and 4 interrogate Douglass’s affirmation of the Constitution’s Natural Rights law and its support for anti-slavery views. Myers maintains that Douglass, who early on was heavily influenced by the militant abolitionist William Lloyd Garrison, (founder of the American Anti-Slavery Society), was later horrified by the growing extremism and calls for violent revolution within the Garrisonian camp (83-84). Myers argues it was Douglass’s aversion to Garrison’s radicalism that motivated his staunch advocacy of non-resistance as a way to garner change; change which he knew would come through natural moral law: “As natural moral law required the support of human positive law, so the efficacy of natural law in America required the support of American law” (85). Douglass found support for this view in George Comb’s The Constitution of Man, a work which gave Douglass “the idea of a self-executing law of nature” (15). For Myers, “Douglass’[s] remarkable hopefulness concerning the demise of slavery and white supremacy in America was not naively or obtusely idealist but was instead marked by a substantial moderation and realism” (12). It is perhaps Douglass’s faith in the ultimate goodness of humanity that helped bolster some antebellum attempts at moral reform. As Myers points out, it is through America’s laws, based on the Natural Rights doctrine, that effect momentous change. In the book’s conclusion, Myers touches on Douglass’s influence upon other significant periods of changing attitudes towards race, such as WWII and the 1960s’ Civil Rights Movement (198-99). There are many rich historical dialogues within Myers’s text; lively feints and thrusts between abolitionists and slavery proponents fill each chapter. However, at times Myers prefers to safely dance around the more intricate complexities of power matrices within slavery culture—titillating the reader with insights, but then stopping short of a deeper excavation. For example, he states that Douglass believed that the slave-holder Aaron Anthony may not “by nature” be a morally deficient man, but the fact that he had “grown accustomed” to the social “exercise of irresponsible power” had robbed him of his natural virtue (37). This case would seem to raise questions about the extent of social influences within antebellum power structures, and of Douglass’s seemingly paradoxical use of nature as an argument in defense of a slave owner’s culpability while at the same time arguing that a human’s “good nature” would eventually prevail. But aside from these periodic dead-ends, Myer offers a richly textured and compelling look at the evolution of Natural Rights, an evolution of thought most evident in our first African American President, Barack Obama, whose own belief in the inherent goodness of the American People reflects a fitting echo of Douglass’s own hope for humanity.